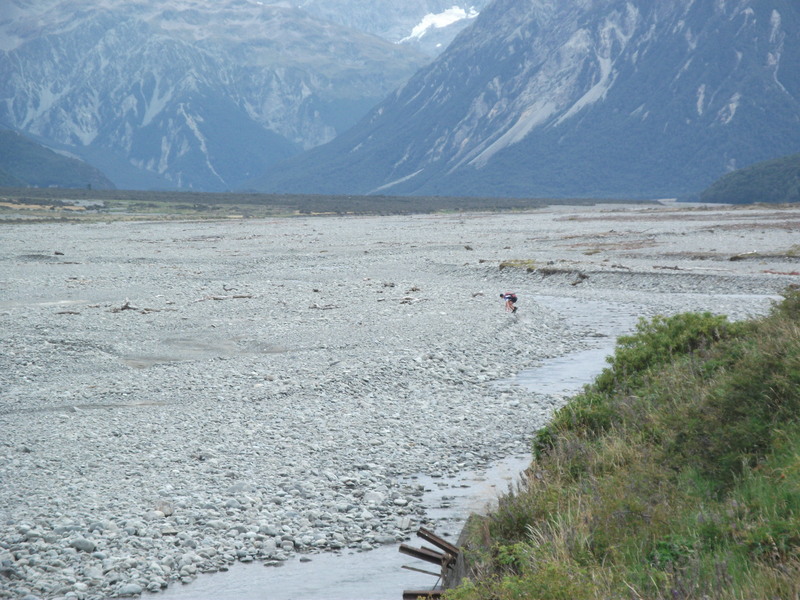 I woke up nervous on Saturday morning in Arthur’s Pass. This year I had done the training, I improved my speed, I got tougher, and had the endurance needed for Avalanche Peak, the weather was ideal, I had been through the race in my head, I had a plan and I knew that if I executed it correctly I was going to win. All I had to do now was to do it! Right from the start I took the lead as per my plan. I wanted to hit the hill in first as I knew I had the hill climbing strength and I didn’t want to have to pass anyone up the hill. Plus to be honest the little bit of the “Prefontaine” ego within me was really keen to get out in front! After about 5mins up the hill I took a look behind and saw and heard no-one…I had the race in the bag already. It was going to be a tough race as now I was in the position I wanted to be in, and now it was my race to lose. I emerged from the bush in about 24mins and started to catch the runners who started 30mins earlier. Still no-one in sight behind me. I pushed hard up the hill keen to make my target time for the summit of about 51mins. Starting up the summit rocks I began to think it was slipping out of reach but it was not long and I hit the summit ridge, and 50:28 to the summit. Once over the summit the race really starts, you can relax into some sort of running rhythm after slogging up the peak in a walk/jog/grunt kind of motion. It was just down off the summit I began to start to feel the effects of a hard climb. Leppin was high on the list of priorities, although I managed to spill it all over myself, getting about half in my mouth. Then in a moment of oxygen debt I forgot how the lock on the camelback worked and I thought I had run out of water. After a couple of wobbly minutes, some momentary panic (turned out to be unnecessary as I was about 9mins up at the summit I was told later) and a little bit of recovery I was back into race mode, just in time for the Crow Slide. I took a less than optimal route down into the Crow last year so this time I looked ahead and found some good parts of tracks to follow….however there was another panic moment, a mistake where I lost 30sec to a minute stranding myself on a boulder, This mistake spurred me on and I was a lot more smart about descending through the rest of the Crow. At the bottom of the Crow I hit the track on the left hand side early, nicely marked by a flag in the riverbed. I really started to enjoy myself once I got into the trees at the bottom. I came through the bush and out into the nice grassy flats in about 1:40 which I was thinking was pretty fast so far. However the return to some nice easy running terrain brought on the thoughts of cramp, so it was time for another leppin….which again I managed to spill half on myself and get about half in my mouth…. I was in a good place after that, I just had to get to the finish now, hooning across the stony river flats. As there was no one behind me I was fairly confident at this point I was going to win. To keep focused I started to think about getting a good time to go with the win. I figured at this point I could possibly win this time with last years time of 2:39:45-ish (which I could have) but I couldn’t quite do that justice so I had a new target of 2:30. The riverbed was a lot faster this year I thought, with much less variation in rock size and minimal crossings…or it may have just been I was that much more comfortable running at that point of a race. As I approached the Waimak bridge I could feel the cramp lingering in my legs, with no salt for emergencies I was really holding out for that “Cramp sandwich” I forgot to pack… Lollies would have to do. Arriving at Klondyke corner in about 2 hours I thought the race record was there for the taking. By the time I reached the bridge in 2:17 I thought all hope was lost for getting close. The river was quite deep under the bridge and I was quite worried about cramping up while in the middle of it so I took it carefully, and the same with the next one, even pausing for a drink. Then the finish line got very close, and it was just a rounding of the flag and then a slow slog up the grassy hill to the finish, much to the surprise of everyone there! I finished in 2:25:49, very close to if not breaking the record set by Keith Murray over 10 years ago. Once over the finish line I was feeling pretty good, still upright, coherent, and most of all pretty damn satisfied. After being interrogated for a while I then headed straight for the powerade and a bit of a sit down. It was 17mins before Marty came in in second place, followed not long after by a couple of young guys battling it out for 3rd and 4th right down to the line. I was very happy with my race, everything went to plan, I executed it well and basically smashed it, very satisfying. Realising how close I came to taking the race record I can now see some room for improvement, especially off the top of the summit (oxygen debt brain function), in the upper Crow (route finding/pre race knowledge) and the Waimak also (cramp avoidance…). So now I am excited about next year but also a little bit apprehensive about the reputation I have created and now have to live up to next year! It should be a good challenge!